When Joe Del was tasked with building the new indoor pistol firing range in a tight area, he knew he needed to find a metal fabricator who worked on specialized projects and who could understand the physics behind firearms discharge and projectile behavior. When someone recommended Chris Aubrey of Modern Metal Solutions (MMS), Joe called him and the project was welcomed right from the start. The project at hand was a difficult metal fabricating and installation project, completely out of the ordinary for most building contractors. 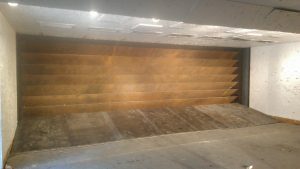 The Chester Rod and Gun Club indoor pistol range presented us with the challenge of very tight existing building space needing to house a 50 foot firing range. Expanding the building was not an option. “All we did was the demolition of the old backstop and Modern Metal took it from there. Chris helped with the design, took over all of the metal fabrication and then had it professionally installed,” says Joe Del about Chris Aubrey, the president of MMS. One of the key differences Modern Metal Solutions offers clients is a deeper understanding of complex, customized metal structures, all the way from their elemental properties to real world applications. We understand how all kinds of metals are used in building, ornamental and industrial applications. “The old pistol range backstop didn’t effectively absorb or collect all of the back splash fragments and we had to add ballistic blinders to protect shooters from stray fragmentation,” adds Del. “These blinders continually needed replacing which was costly.” Joe Del looked over several different designs and Chris from Modern Metal worked with him to choose the right one for Chester Rod and Gun Club’s unique situation. MMS then went to work drafting, fabricating and installing new Venetian blind style backstops where bullets are deflected back and down metal fins.